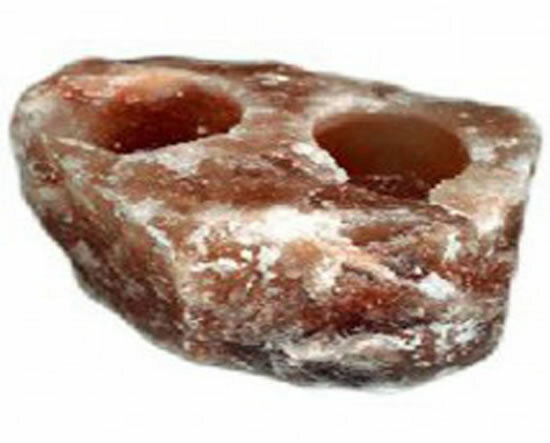 Choose a salt crystal candle holder and own something special and unique. - No two are the same. Each piece is hand sculpted to preserve its own natural beauty. Some of the more dramatic claims include migraine headache relief, enhanced serotonin levels in the blood, reduced severity of asthma attacks, immune system enhancement, and reduced vulnerability to colds and flu's. 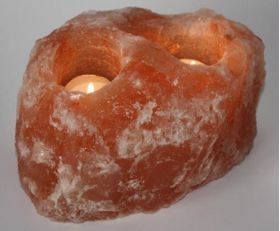 Himalayan crystal salt tea light holders Are beautiful and original pieces that have an elegant shape and many variations of color. As the fire lights the salt crystal, it creates a warm, glowing, healthy ambiance. Each come individually boxed. No two are alike, due to the nature of rock size, color and shape may vary. Larger and able to hold two candles, this fine piece gives off a subtle glow that is soothing and relaxing.